2016 has greeted us, so far wet, windy and mild. At this time of year I like to review the previous year and think of aims for the following year. Creating resolutions is fun! Of course trying to stick to them or transform the 10 year old resolution into reality is something else. This year I plan to do what I did last year – make my resolutions, and then completely ignore them for the next year. Then 2017 comes I will have a good laugh at my intentions, I find humour is the best way to deal with shortcomings. There is nothing like a good laugh at naivety, what didn’t go to plan and misplaced vigour. Letting go of my expectations to have succeeded, and to achieve goals in the future clears me. Then I can be honestly grateful for the year and all it has brought. Health, love, friendship, food, a beautiful world with beautiful people, leaves blowing in the wind, shards of sunlight and more. 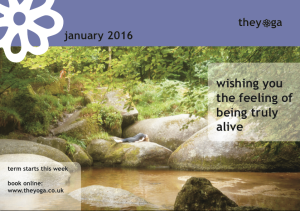 Wishing you the feeling of being truly alive for 2016.